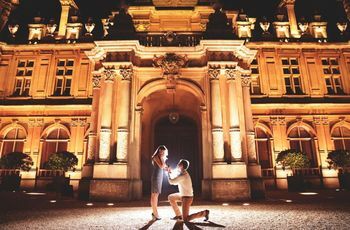 How to Personalize Your Marriage Proposal | Wedding Tips ARE YOU A SUPPLIER? Looking to infuse your marriage proposal with a bit of personality? Here’s a few ways to make it happen. Want your marriage proposal to be practically perfect in every way? Of course you do! You’re not going to achieve that by borrowing a bunch of clichés you’ve seen on the silver screen, so you’re going to have to get creative and infuse your plans with a bit of your personality. These tips will help make your big moment even more meaningful, so use them to your advantage. Here’s how to personalize your marriage proposal. First things first - hitting the shops to find your partner’s dream engagement ring. Now, this can be tough if they haven’t dropped any clues, but you can learn a lot from their friends, family and the type of jewellery they wear on the daily. Remember, all parts of a ring are customizable - the stone, the setting, the band design, the metal - so you can really play to their interests. When most people think of a wedding-worthy heirloom, their mind automatically goes to a ring. But, good news, if you’re not dating a guy or gal who loves vintage baubles, there are other options. You could incorporate a stone or metal from an heirloom piece of jewellery into a custom ring design, use the same ring box your grandad put your nan’s ring in, wrap the ring in their mum’s monogrammed handkerchief or try something completely outside of the box. Seriously, there are endless ways to incorporate an heirloom in your marriage proposal, you just have to flex your creative muscles. 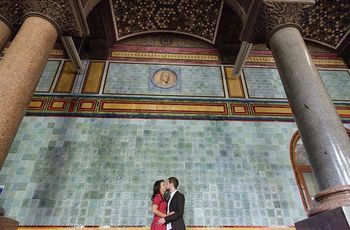 The aim of the game is to show off how well you know your partner with your marriage proposal location. If they’re a total diva and enjoy the finer things in life, think about booking a staycation in a luxury hotel and propose while you’re hanging out in fluffy bathrobes. Or, maybe they love the bees, trees and all of Mother Nature’s gifts? Think about popping the question by a pond or on a nature trail. You’ve probably got a ton of amazing options waiting to be discovered in your hometown. Every couple has a song, whether they know it or not; it’s that one you blast in the car, the one you sing at karaoke and the one that defines your relationship (it doesn’t even have to be a traditional love song). Now, you totally get bonus points if it’s a sappy slow song, but if your heart starts pounding every time you hear a upbeat Ellie Goulding track, we’re not going to judge. What matters is that the proposal soundtrack fits you and your partner perfectly. Who says you have to fly solo for your marriage proposal? If you’re super close with your families or want to get your friends in on the surprise, we say go ahead and invite them. They can play a role in your proposal (if they’re good actors) or hideaway and jump out to celebrate when they your partner says yes.